Mediterraneo Suite Home is located in the heart of the old town of Rethymno, in the centre of the historic and commercial area and surrounded by the narrow streets of the Venetian part. The distance to the unique sandy beach is only 500m away and just a few minute walk from restaurants, bars and cafes. The Venetian fortress along with the rich collection of the Archaeological Museum is easy reachable (200m). The renovated Venetian house of a total area of 130 sqm consists of three levels. On the ground floor there is an elegant marble entrance with a bedroom for 2 people, separate toilet, and a vaulted stone ceiling shower room. A modern marble staircase leads to the first floor. 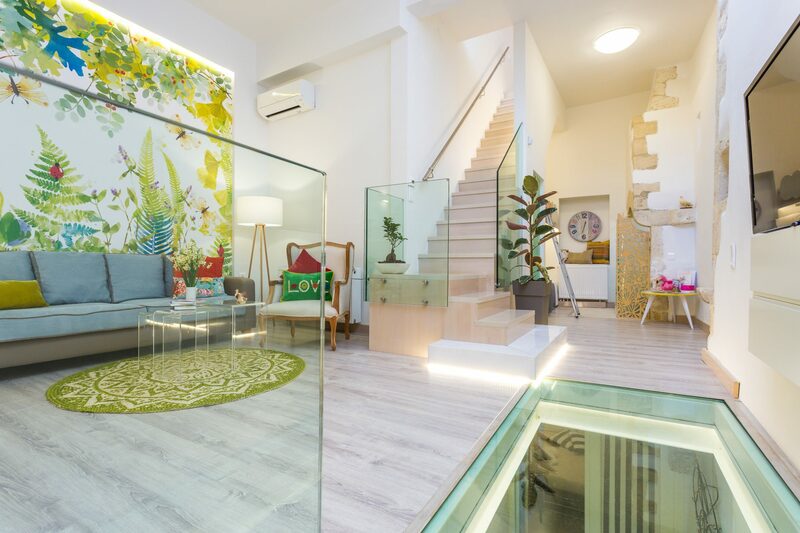 An impressive glass skylight that is combined with the decor creates a feeling of a relaxing and optimistic atrium. This level is dominated by typical Venetian stone elements and spans over two floors. There is a spacious and modern kitchen, fully equipped for comfortable dining and seating for 6 people. On the same level there is the master bedroom that includes double bed, toilet, shower and spacious closet with washing and drying machine. Finally, the children area consists of a bunk bed, toilet, and separate shower established in the restored Venetian fireplace. The second staircase leads to the third level where a small room is equipped with a day bed and desk, ideal for rest and work. Just outside, under the shadow of the Venetian castle, the picturesque and landscaped terrace of the house is ideal for peaceful mornings and romantic evenings with a marvellous view of the Fortezza castle, the so called ‘Turkish’ school and the continuous roofs of the old town. The terrace is furnished and equipped with barbecue facilities. Our home is equipped with air conditioning, central heating, Wi-Fi and flat – satellite smart TV, Cocomat sleep system, bed linen, towels, bathrobes, safe, dishwasher, coffee maker, kettle, toaster, dinnerware dishes and glasses, washing machine, vacuum cleaner. It hosts up to 6 people, with a possibility for 1 more guest on the 3rd level day bed. As the residence is being managed by Hotel Ideon, 24-hour concierge services, and 24-hour maintenance services are being provided. Further, free of charge pool usage is offered in the Hotel facilities just 400m away. Upon request we offer the following extra services: breakfast, lunch, dinner or barbecue, babysitting, press delivery, car rental, transport to and from the airport and port, private tours / excursions.